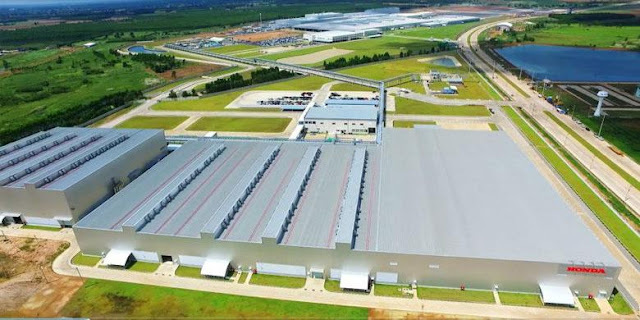 Honda Automobile Thailand inaugurated the opening of the new plant is located in Rojana Industrial Park, Prachinburi province, Friday (05/13/2016). This makes Thailand as a production base for Honda's fourth-largest in the world, with a total annual production of 360,000 units. The factory is equipped with the latest technology of Honda, with a production capability of efficient and environmentally friendly. The existence of the plant is expected to increase the number of supplies to the Thai domestic market and export. With the concept of "providing quality products with an optimal balance between human expertise and advanced production technology", Prachinburi Plants have adopted cangih Honda's production technology. Also inherited the environmentally friendly technology of Honda Yorii Plants, which is perusaan with tercangih factory in Japan. This new facility assembles the latest generation (tenth generation) Honda Civic since March 2015. Previously, the production activities carried out for plastic components and engines, which have been conducted since October 2015m continued until February 2016. In addition to the Civic, Honda also expressed readiness to assemble subcompact and compact models in the foreseeable future. "Thailand had increased its presence as one of the centers of production Honda, as a supplier of products and components, not only for the domestic market, but also the whole world, including ASEAN, thus encouraging sales growth," said Takahiro Hachigo as President and CEO of Honda Motor Co. Ltd. Besides in Thailand, expected Honda also will continue to expand investment in Indonesia. Honda's production capacity in the country right now, has reached 180000-200000 units per year, at its two factories located in the Industrial Area Mitrakarawang, Karawang, West Java. When compared with Thailand, the new production figures are only half.